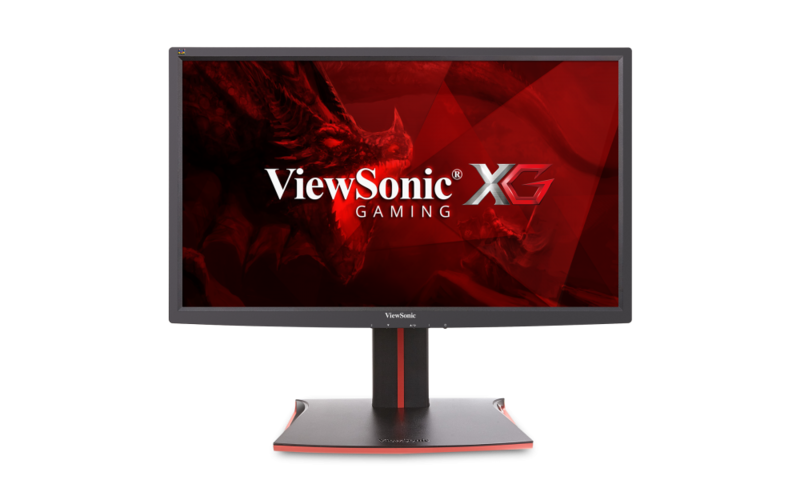 The ViewSonic® XG2701 is a 27” Full HD monitor packed with all the speed and features that diehard gaming enthusiasts need. Featuring an incredible 144Hz refresh rate, as well as VESA Adaptive-Sync Technology, this monitor’s variable refresh rate capabilities virtually eliminate screen tearing and stuttering for fluid gameplay during fast-paced action scenes. A blazing-fast 1ms response time and low input lag provides smooth screen performance even in the most graphic-intense sequences. For optimum speed and performance, SmartSync technology automatically selects the best refresh rate and response time, and lowest input lag needed in FPS games. For a game-winning competitive edge, a Game Mode feature optimizes visuals for FPS, RTS and MOBA. On top of that, a black stabilization function helps you target enemies lurking in the dark, while the monitor maintains brilliantly rich colors and contrast. With a gamer-inspired ergonomic stand that features an integrated headphone hook and cable management functionality, the XG2701 has all you need to conquer your gaming and entertainment quests. With a swift 144 Hz refresh rate, this monitor delivers greater visual fluidity and awesome graphics no matter how quickly the in-game action unfolds. Say goodbye to annoying tracers and motion blur, and up your A-game with the smoothest visuals possible. With an ultra-fast 1 ms response time, this monitor delivers smooth images without streaking, blurring or ghosting. For any and all fast-paced action sequences, you’ll be glad your monitor reacts as quickly as you do. Leveraging VESA Adaptive-Sync connectivity, this monitor is equipped with AMD FreeSync technology* that seamlessly synchronizes the frame rate output between your graphics card and monitor. This dynamic refresh rate effectively eliminates image tearing, stuttering, and jerkiness for smooth gameplay. *AMD FreeSync technology with DisplayPort 1.2 a connection port. When the action on the battlefield gets intense, you need a monitor that can process every command from the keyboard, mouse, or controller as soon as they occur. With a built-in process reducer, this monitor does just that – decreasing the delay between all inputs, and allowing you to react in real time against any competitor. ViewSonic’s Black Stabilization feature provides heightened visibility and detail by brightening dark scenes. Dominate the competition with enhanced visibility, even in the darkest scenes of a video game. 02. Headphone Hook; 03. Internal Speakers; 04. VESA Compatible Wall Mount (100 x 100mm); 05. Kensington Lock Slot; 06. AC In; 07. Cable Management Ring; 08. USB 2.0 (x2); 09. USB 3.0 (x2); 10. Headphones; 11. DisplayPort; 12. Mini DisplayPort; 13. HDMI (x2). Warranty: 90 days limited warranty on parts and labor.